Finally! A new car! Okay well, not new, but new to me. For months I have been wanting a newer vehicle to ride around in. Some of you already know that our only car to ride around in for the last 4 years is a 1971 VW Bus. Yes, it is very, very cool, however the last 6 months it has been breaking down every month or so. First it was the brakes, the brake caliper and the brake line, giving out when we were in traffic on our way home from New Orleans. That was fun…NOT. Then it was the fuel pump on our way to my birthday lunch in Baton Rouge. What a way to spend a birthday. After those two incidents and few other minor ones, I was not in a big hurry to go anywhere farther than just into town here to get groceries. So we had been talking about about getting a newer vehicle for about a month now. You know pouring over finances and working on a plan. We were about 2 or 3 months out from really doing anything, when the VW decided to lose reverse. Just dropped it. We can move forward, but not backward. Plus it is not sounding so good. So the VW has been benched and Deanna got a new car. 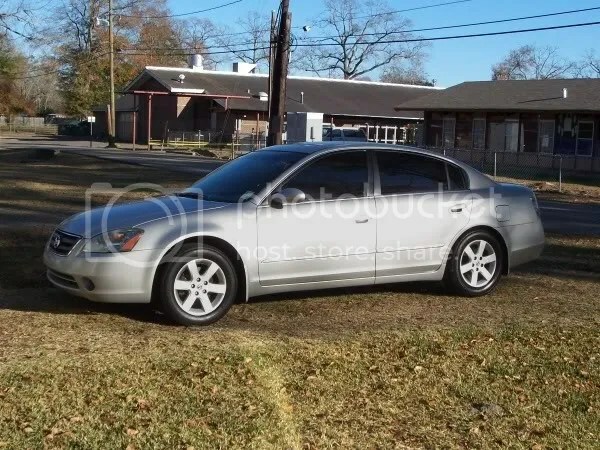 A 2003 Nissan Altima! Whoop whoop! I feel so 21st century. I never had a car with automated locks before. LOL! So the new wheels leads me to the blowout, below wholesale, SALE we are having in the etsy store. Everything is already marked down. Just follow the link. www.CDLampwork.etsy.com This is by far the best sale we have ever offered. Time to clear out older inventory and make room for new. Happy Shopping! Okay, so I don’t talk politics much online. Mostly with just Greg, my hubby and in our own home. However, I just have to say that is an exciting historic time for the nation. The two perceived front runners for the democratic party are making history and I am excited to be here to see it. I will spare you my views and opinions, but want to encourage everyone to vote, no matter who you are or who you want to vote for. Get out there and let your voice be heard! I am looking forward to a better next four years no matter what happens. Okay, so enough politics. I am ready for Spring to get here. Really, I mean we have only had a few weeks of winter at best here and even then we have had some 70 degree days. However, all my plants look sad and like they have gone to sleep for the time. I am ready for them to come back to life and add color to my front yard. It isn’t all bad though. Our tree in the back is blooming pretty reddish/pink flowers. That is something. Have a fantastic day, the sun looks to be coming out. YAY! When moving to Louisiana, we knew we would have access to some local farms and crops. What I didn’t know is that the first strawberries of the season are in early January. Early January? Yes, it has hit freezing here lately a few times, but apparently the berries survived and I couldn’t be more thrilled. Strawberries are my all time favorite fruit and maybe even my all time favorite food ever. There is nothing better in my opinion that a fresh picked strawberry. In fact any time we drive by a u pick strawberry patch, no matter where we are or what we are doing I ask Greg to stop. He doesn’t always, but most of the time he does. Yes, I do go out and pick a flat of them, even though I could just get the already picked ones right there. I like the fresh, fresh picked. They just taste better. Yum strawberries. I need to get some today. Speaking of freezing, we had a couple of freezing nights this last week and I think I may have lost a few of my hibiscus plants. One of them is fine, but the other two are not looking so good. My basil plant looks pretty sad to and I chopped it back, but have no doubt that thing will come back in full force. It had taken over the herb pot. Yikes, aggressive thing. I also took it upon myself to prune the sad pear tree we have. I ended up on the roof of the shed. I bet Greg didn’t think I’d really go up there. I did as much as I could reach from the ladder and the roof. Hopefully it will do better this year. Last summer it looked really sad, but it is clear it hadn’t gotten any love for a while. Hopefully this year will be a come back year for it. Just a reminder, we are still running our 20% off sale on the website. Today is the last day!